Sixty-five. That’s the number of quality checks just one batch of beer goes through before heading out the door here at Dogfish Head. 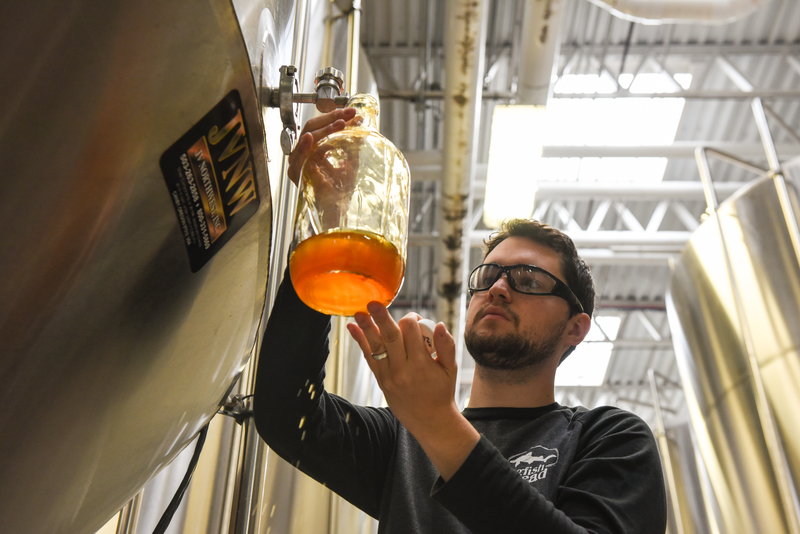 Whether it’s running a sample through the gas chromatograph to check for appropriate levels of diacetyl, or counting yeast cells to determine viability for pitching yeast, there’s a whole lot of #beergeekery that goes into the making of an off-centered ale. But there’s one particular part of the process that looks beyond our quality assurance lab and enlists the help of co-workers from a myriad of backgrounds, and that’s our daily taste panel. A key component of our sensory program, taste panel consists of accountants, marketing-type folk, tour guides and more. It doesn’t matter where you work in the brewery as long as you’ve got the snuff to help sniff and sip a beer to perfection. Leading the charge to do his collective part in ensuring consistency in each and every beer is our sensory specialist Joe Spearot. With a BA in Biology / Chemistry from Arcadia University and a Masters in Food Science from Drexel University, Joe has spent the better part of 8 years fine-tuning his knowledge of all-things food and beverage - a valuable addition to our already rigorous sensory program - and is on his way to adding yet another notch in his educational belt. The Cicerone® Certification Program has become “the industry standard for identifying those with significant knowledge and professional skills,” and is a program that supports everything from basic beer knowledge, to full-on expertise and prestige. A combination of multiple choice questions, written response and blind tastings, there are four varying levels of this program - Certified Beer Server, Certified Cicerone®, Advanced Cicerone® and Master Cicerone®. Joe has already tackled both level one and level two, and is on a quest to capture that level three title - Advanced Cicerone®. As it stands now, there are less than 100 people in the world with the Advanced Cicerone® certificate - a testament of the intensity and breadth of the exam. Primed with five years of beer industry experience and a wealth of knowledge, this level three exam is proving to be a challenge, but one that Joe happily accepts. Using his own cloud-based tracking system, Joe recruits friends and family members to accompany him on his beer tasting adventures, taking meticulous notes of the appearance, aroma and mouthfeel. While fun, it’s all in the name of research. A one-day exam that includes various formats, including multiple written, oral, and tasting components, the Advanced Cicerone® certification requires a holistic understanding of beer, as well as the ability to identify ever so slightly differing characteristics between more than 90 different beer styles. The test is scheduled for February, so with only three months left to study, Joe is all-beer, all the time. But beer wasn’t always in the cards for this sensory specialist. 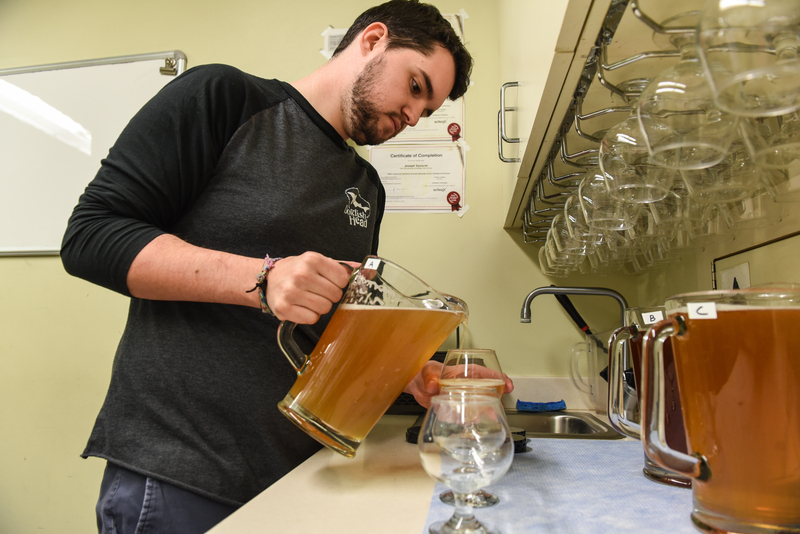 Instead he found inspiration from people like Food Network’s Alton Brown, and cut his teeth in the beverage industry with an internship at an Australian vineyard before busting into the beer scene at Yards Brewing Co. in Philadelphia. 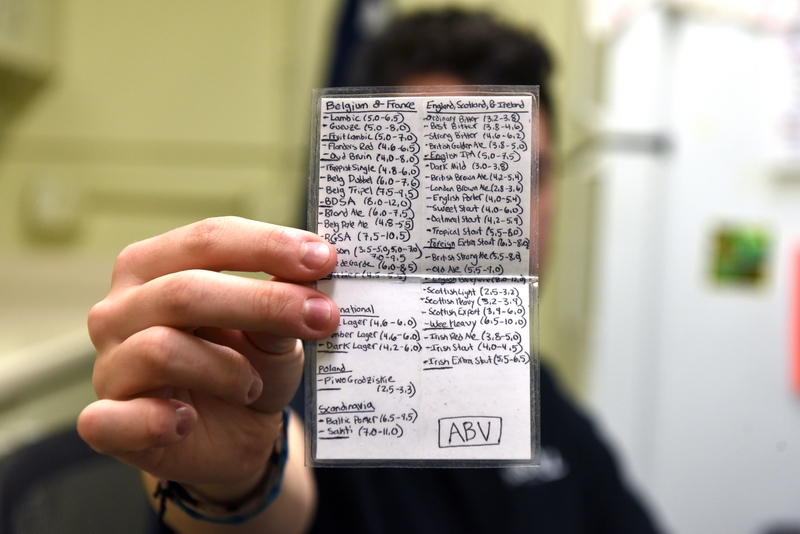 Producing a folded note card with writing so small you almost need a magnifying glass to read the words, Joe carries around a list of those 90+ beer styles with their respective region and ABV for an on-the-go approach to preparing. “It’s pretty much beer at work, beer at home,” he says. With a sensory program that’s been in effect since 2006, Joe’s goal is to continue to grow and evolve the program, and this Advanced Cicerone® certification is just one more tool in his already well-armed arsenal. We’re rooting for ya, Joe! Update (Apr. 4, 2019): Joe passed the exam is now officially an Advanced Cicerone®!